4 points from home games against Sunderland and West Ham is a decent (if not spectacular) return and matches that gained from the equivalent fixtures last season. As Laudrup mentioned, West Ham are in 'our league' and even if they don't play the most sparkling football, they are no mugs and a point is an OK result from a match that could have gone either way. Swans with most of the ball, but going side to side, West Ham going long and straight and with the ball going more into the danger area. 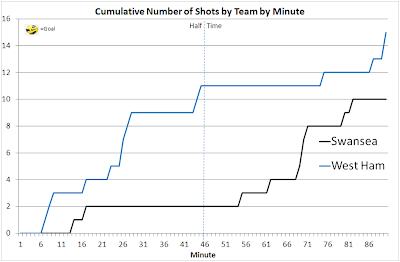 Looking at shots over time in the match, there are large periods of flat lines for both sides with Swansea only having 2 attempts in the whole of the first half and no attempts between the 17th and 54th minute. Similarly West Ham have only a single attempt at goal between the start of the second half and the 86th minute. 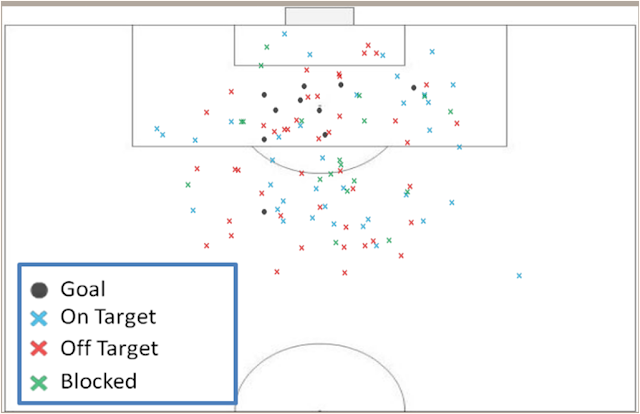 Swansea only had 10 attempts all game, 4 of which came in a couple of minutes in part due to a couple of blocked/shots clearances in quick succession. 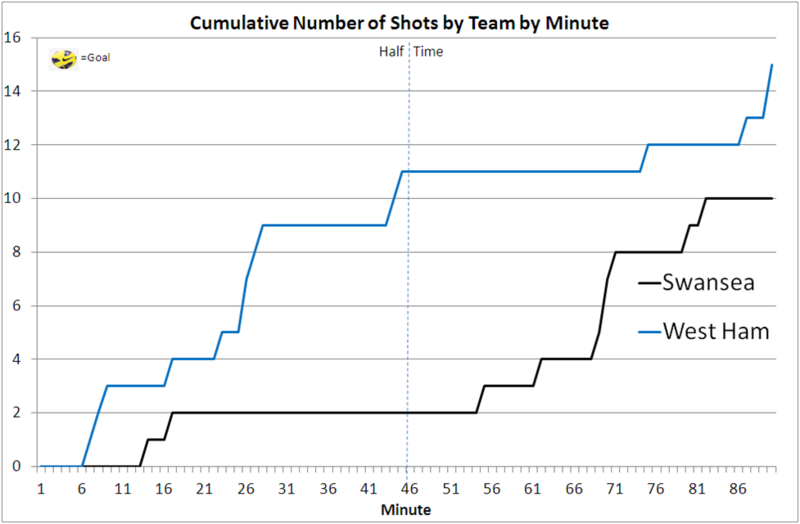 At half time the shot count was 11 to 2 in West Ham's favour despite Swansea having most of the ball, in some ways not playing a striker in a 4-6-0 formation can be thought of as negative but it also means that when you do counter attack, you have the benefit of space that isn't afforded to the team with most of the possession. I'm currently looking at shot location for the Swans so far this season and it's noticeable the lack of goals from outside the box (as has been the case in previous seasons), this combined with the low number of goals from set pieces (even allowing for last week vs. Sunderland ) means that the Swans have to work pretty hard for each goal where other teams might have a greater number of 'lower effort' goals (whether that's long range shots or set-pieces). The black dot that stands out in the chart above is, De Guzman's vs. Sunderland as almost all the Swansea goals so far this season have come from 'Prime' positions. Shelvey's vs. Liverpool the other exception. In terms of plus points from the game, as well as Ash's return, Pablo was also impressive in his half hour or so on the pitch with more take-ons than any other player (5 from 5 attempts) and offers something more direct, not in a lump it forward way, but in a willingness to try the killer ball (which is in some ways why some people get on his back as when it doesn't work it can look wasteful). It was surprising to see Bony's form raised as a talking point from the weekend in the Guardian. I think being a club's record signing by some distance means that big things are expected but I think the line in the piece about Laudrup not being sold on Bony is hugely overstating things although I've no idea if Laudrup will look to keep it tight and controlled with both Leon and Canas starting v. Cardiff or if he'll think that a game that might be high-tempo (and high-tempered) would benefit from a more attacking line up to exploit the likely spaces.